The Bond car is as elemental to the spy series as the femme fatale, and it has seen many iterations over 24 films and 50-plus years on the silver screen. Being MI6’s top agent, Bond’s ride is often more than just a car, equipped with various technological upgrades from bulletproof windshields to missile launchers. Some have been understated, like many of the Aston Martins featured in Daniel Craig’s entries, while others have literally transformed on screen. Any Bond gadget is fun to watch, but there is a particular thrill in those behind the wheel. The cars combine stunning beauty with brutish violence and a dash of hi-tech espionage, much like 007 himself. There have been a wealth of cool car gadgets since the release of Dr. No in 1962, but a select few stand above the rest. It’s hard to imagine the AMC Matador as a “Bond” car (though it technically isn’t, as it belongs to the film’s villain, Francisco Scaramanga, played by Christopher Lee), which is why the 1974 Roger Moore installment smartly equipped it with the ability to turn into a plane. Not as hi-tech as the Lotus Esprit from The Spy Who Loved Me, the Matador needed wing attachments in order to achieve flight. Bond’s most iconic car was tricked out with all sorts of useful gadgets. One of the best was its dual-purpose hubcaps, which were both stylish and effective tire slashers. Though not technically a Bond car (it was driven by Whisper in the 1973 flick), the Eldorado had one cool trick up its sleeve. Poison darts shot out of the sideview mirror, which Whisper employed to kill Charlie. Stepping up the series’ hubcap game, the Aston Martin featured in Bond’s 15th adventure contains numerous gadgets, including hubcap lasers, because slashing just doesn’t cut it. Bond’s primary ride in the 1997 edition was unassuming from the outside, for a 007 whip. Looks can deceive, and the beemer packed a punch with a host of technological upgrades, including re-inflating tires and the ability to be remote controlled with the use of a state-of-the-art Ericsson smartphone. Many Bond cars have featured missiles, but the BMW Z8’s surface-to-air projectiles that shot out of the vehicle’s side vents were particularly awesome. In the 1999 film, the MI6 agent uses the missiles to shoot down a helicopter. The Vantage Volante was one of Bond’s coolest, and most technologically savvy, cars, thus it makes a second appearance on the list. This time for taking a page out of Batman’s book, with rocket propulsion. Much of Pierce Brosnan’s run as 007 featured vehicles produced by BMW, but for the series’ 20th anniversary, and Brosnan’s last escapade as the famed spy, Aston Martin was once again brought in to supply MI6’s most notorious agent with a set of wheels. 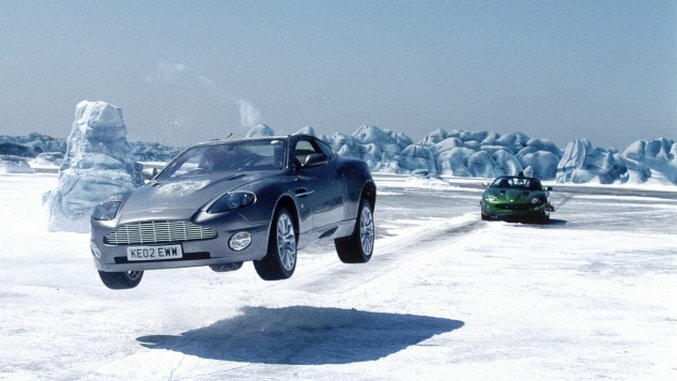 The Vanquish featured in Die Another Day was one of Bond’s most beautiful cars, and it helped usher in a new era of Bond car, laying groundwork for those featured in Daniel Craig’s entries. It was also well-stocked with gadgets, the coolest being it’s ability to cloak. Undoubtedly one of the coolest vehicles in Bond history, when the Lotus Esprit transformed into a submarine in the 1977 film, it set a new standard of gadgetry for Bond cars to live up to. The DB5 is the quintessential Bond car, and the ejector seat is the quintessential Bond gadget. It may not be as cool as the Esprit turning into a submarine, but it is far and away the car gadget most intrinsic to Bond himself. Like 007, the ejector seat is sly, humorous and provocative.